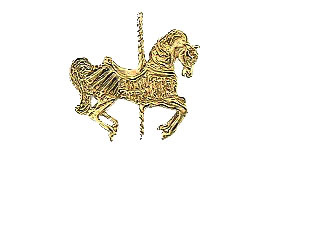 Ideal for an omega necklace, a heavy chain, or even enjoy this piece on your lapel. PICTURED AND PRICED HERE ON 14KT YELLOW GOLD! If you're a collector of Carousels, the one you see here is a great design. Offering the image in relief makes for a different look, Certainly to be enjoyed by the Carousel enthusiast!